Royal Oakes has extensive trial and appellate practice in the fields of insurance, employment and general business law. He has litigated hundreds of cases in the areas of bad faith law and unfair business practices. Mr. Oakes is a well-known television and radio legal commentator. Nationally, he is an ABC News legal analyst, regularly appears on the television program "Inside Edition" and fills in as guest host for "The Dennis Miller Radio Program," nationally syndicated by Westwood One. In Los Angeles he is legal analyst for NBC4 television and KNX all-news radio, and fills in as guest host on KABC Radio. 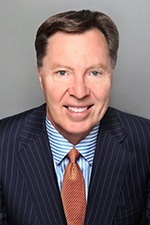 Mr. Oakes became a partner at Hinshaw & Culbertson LLP in October 2014 as a result of the merger of Hinshaw and the Los Angeles-based firm of Barger & Wolen LLP. Mr. Oakes has extensive experience in the employment law field, and in recent years has achieved numerous victories regarding the classification of independent contractors and employees. Mr. Oakes was lead counsel for the prevailing party on this issue at the appellate level in the case of Beaumont-Jacques v. Farmers Group, Inc., 217 Cal. App. 4th 1138 (2013), and at the trial court level in the case of Pexa v. Farmers Group, Inc. (Sacramento Superior Court, 2012). Mr. Oakes has served as lead counsel in numerous appellate cases in the fields of insurance, employment and administrative law, including victories in the California Supreme Court and the U.S. Court of Appeals for the Ninth Circuit. He was lead counsel in Farmers Insurance Exchange v. Superior Court, 2 Cal. 4th 377 (1992), in which the California Supreme Court established the doctrine of primary jurisdiction. Mr. Oakes is a prolific author. His articles have appeared nationally in such publications as USA Today, the Chicago Tribune, the Dallas Morning News and the San Francisco Chronicle. In Los Angeles his op-ed pieces have appeared in the Los Angeles Daily Journal and the Los Angeles Times. For five years Mr. Oakes was the business litigation columnist for the Los Angeles Daily Journal. He was interviewed for and was the focus of a Law360 Q&A article in 2013. Mr. Oakes has been interviewed and quoted in many publications, including PlanSponsor Magazine, Claims Journal and Business Insurance. Mr. Oakes was a co-editor of Barger's employment law blog. Mr. Oakes is a lifelong resident of the Los Angeles area, enjoys playing golf and straight pool, and persists in believing in the myth of the Freeway Series.